Bhopal: An Assembly constituency in Dhar district of Madhya Pradesh has become a bone of contention between the Congress and Jai Adivasi Yuva Shakti (JAYS), a fledgling tribal political outfit, which are currently engaged in alliance talks for the next month's state polls. The opposition party has been winning this seat since 1972, except losing it only twice- in 1990 assembly elections and 2012 bypoll. Talking to PTI on Friday, JAYS convener Dr Hiralal Alawa said, "Our seat-sharing talks with the Congress are underway. We want to contest the upcoming election from 40 assembly constituencies. Fighting from Kukshi due to our strong presence there is top on our agenda." Another JAYS leader said, "We have categorically told the Congress that we want to contest from Kukshi. The fate of alliance depends on this seat. If the Congress is adamant for this seat, then the alliance talks might even fail." "We have already demonstrated our strength in Kukshi by organising Kisan Panchayat programme held on 2 October. Over one lakh tribal youths had taken part in the event," he added. Kukshi seat is currently held by Congress' Surendra Singh Baghel, a supporter of senior party leader Digvijay Singh. Baghel said he was all set to contest the upcoming polls from this seat, and also expressed confidence that he would win it with a huge margin. Another Congress leader said, "Kukshi is our traditional seat and we can't let it go so easily." The JAYS has made its presence felt in 22 tribal seats spread across Alirajpur, Ratlam, Jhabua, Dhar, Khargone, Burhanpur, Khandwa, Dewas and Barwani districts in Malwa-Nimar region of western MP, which has a sizable tribal population. has nine MLAs as against the ruling BJP's 56 legislators in the region. Besides, this time the Congress is treading cautiously as it seems to have learnt a lesson from its disastrous defeat in the 2003 state elections when a tribal political outfit Gondwana Gantantra Party (GGP) in eastern MP had eaten into its vote bank. Although the GGP managed to win only three seats in eastern MP in 2003, it had nibbled into a major share of the Congress' traditional tribal vote bank. The GGP had won 5,17,270 votes, especially in the tribal-dominated areas. 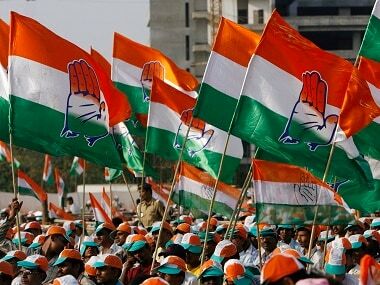 The Congress had managed to win only 38 assembly seats out of all the 230 constituencies in the state, whereas the BJP had won 173 seats in the 2003 polls. The opposition party, which has been out of power in MP since the last 15 years, had earlier tried to stitch an alliance with the BSP for the upcoming elections, although it failed to work out. The state is going to polls on 28 November.